At the start of spring, it’s always important to clean your outdoor spaces, whether a deck, a screen porch, or a gazebo. 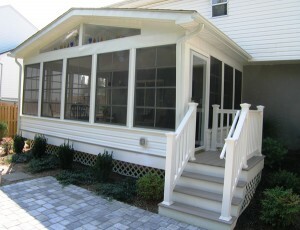 Your screen porch is bound to be a destination of spring and summer fun at home. From enjoying a quiet afternoon alone to entertaining guests for a special occasion, your screen porch is the perfect place to enjoy great weather and time with friends. However, at the start of spring, it’s always important to clean your outdoor spaces, whether a deck, a screen porch, or a gazebo. The right cleaning and preparations will have your screen porch looking beautiful and ready-to-go for any spontaneous spring entertaining! Consider these four easy steps for preparing your screen porch for spring. Before you begin cleaning your screen porch, it is essential to remove your porch furniture and decorations. This initial step will allow you to thoroughly rinse and clean your floorboards, screens, and walls so that they are free of dust for the start of spring and summer months. Removing furniture and decorations will also allow you to clearly see your space and rearrange furniture as necessary for a new use of your space at the start of the season. Once the room of your screen porch is cleared, you can easily rinse your screens and floor boards on a gentle hose setting. This step will rinse away any dust and pollen that may have accumulated in your screen porch throughout the fall and winter. After your screens, floors, and walls have been thoroughly rinsed, it is important to wipe down surfaces to reduce any excess moisture. Doing so will allow your screen porch to dry faster and more completely so you can return your furniture to the space without the potential for mold growth. A final wipedown of your screen porch will also help to ensure that it is completely free of dust and pollen before you decorate for the new year. For couch cushions, curtains, or area rugs, it is essential to wash or vacuum these fabric surfaces before returning them to your screen porch. This step will help to prevent dust and pollen from trailing into your newly cleaned screen porch. Once your porch is completely clean, it will be ready to enjoy for the warmer days of 2019!